Are you ready to make Hawthorn together? This is going to be a fun one. Together over the next few weeks, we’ll be making Hawthorn. Then to wrap it up, we’ll choose several favorites for you to vote on (similar to the Readers’ Choice portion of the Laurel contest), with prizes from Colette Patterns and Hart’s Fabric. Quick note: A few customers alerted us to a couple typos / bits of errata in some of the early digital patterns, which have been fixed. If you’re using the digital pattern, I encourage you to log into your account at colettepatterns.com and download the updated version. This just applies to the digital pattern. Hawthorn is a gorgeous shirtdress in a simple 1950s style that works on a variety of body types. 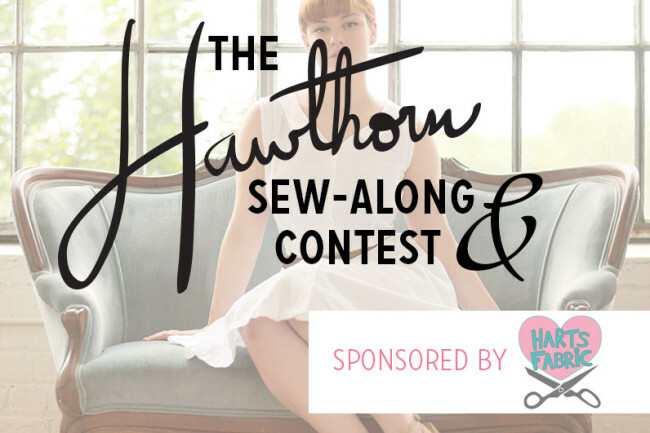 Learn to fit and sew the Hawthorn dress (or the peplum top version). You’ll learn all about creating cuffs, binding with bias tape in a circle, and more.